This product may seem new, but it really has been around for 20 years. 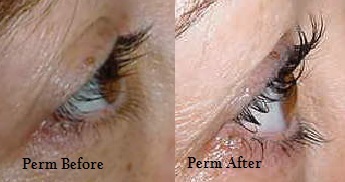 The eyelash perm is designed just for use around the eye area. It is safe and gentle. Detailed instructions make it easy for you to apply to yourself or add this to your salon beauty treatments. to purchase your kit today click here. THROW AWAY YOUR EYELASH CURLER. Having curled lashes will give you the effect for more and thicker lashes. Your eyes will look more alert and not so tired. If you are like me and suffer from straight lashes. You will go crazy for this beauty treatment. Love your lashes after swimming, sweating, or waking up in the morning... You will be wondering why you didn't do this sooner. The process is easy to do. click on the instruction link for details. Kits contain everything you need to curl your lashes. 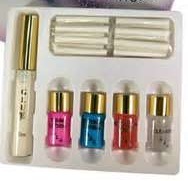 Personal or smaller size kit contains: 3 sizes (s,m & l) perm rods, perm glue, perm solutions steps 1 thru 4. The price of this kit is only $29.95 can do approximately 24 procedures. (Pictured below on the left) Larger Pro Kit includes perm glue, 3 bottles of step 1 and step 2, 2 bottles of step 3 and 4. Plus perm rods (s, m & L) enough product to do 48 perm procedures. for only $49.00. (pictured below on the right) Great for the salon use.